Rating: Worth every bit of the $8 bucks for one month of Netflix. 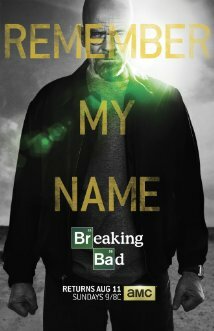 Summary: With a few weeks before the premiere of the final season of Breaking Bad, a friend’s recommendation had gotten me to take a second look at this Emmy winning series. The suggestion had been viewing Season 1, Episodes 1-3, of this dark suburban drama. Just past his 50th birthday, Walter White, a high school teacher, had been confronted with terminal lung cancer. Walter’s response had been a relentless desire to posthumously provide for his family. This motivation had driven him to establishing a business relationship with a local drug dealer, Jesse Pinkman. Walter’s incremental transformation into Eisenberg, his alter ego, had been the core appeal of the show. With every violent and criminal act, Walter had gone deeper into the shadows, losing his humanity. Unsatisfied without an empire or enough money (i.e. $5 million), he had continued to tempt fate, regardless of the danger to friends and family. Pursuing Walter had been various players from the drug underworld and law enforcement, including Hank Schrader, his DEA brother-in-law. As counterpoint, his wife, Skylar, and son, Walter Jr., have provided personable moments, periodically grounding Walter as the family man (i.e. making breakfast, driving lessons). In Season 3 and Season 4 , Walter’s relationship with his wife and crime boss, Gus, had been hitting rough seas. In a moment of vulnerability, Walter had stopped by Hank Schrader’s office for counsel. He had started to explain to Hank, “Skylar no longer loves me.” Walter had proceeded to breakdown emotionally, tearing up and head facing down. Upon Hank leaving to get them coffee, Walter had immediately pivoted to bugging Hank’s wedding picture and work pc. At Hank’s return, Walter had pushed the frame of the wedding picture back together emoting loss, versus his true deviant purpose. This scene had encapsulated the whip neck performances of Bryan Cranston, and the jarring ability of the series as a whole. The setup for the final season, Walter had begun running out of business partners, trust and time. Walter White had been “the man knocking at the door”; however, the inertia of bad choices had established his final descent. If unsure about stomaching this show, I had seconded my friend’s advice for watching Episodes 1-3 of Season 1. Test drive that portion of the series, that had been a good measure of what to expect. iTunes had just posted a Sneak Peak scene from the premiere of the final season. You can pre-pay iTunes to auto-download the rest of this final season or just DVR AMC Channel starting Sunday, August 11, 2013 Sundays 9/8C. This entry was posted in Film and tagged Breaking Bad Seasons 1-5 on Netflix. Bookmark the permalink. Excellent post. I was checking constantly this weblog and I’m impressed! Extremely helpful information specifically the final section 🙂 I take care of such information a lot. I used to be looking for this particular info for a very lengthy time. Thank you and good luck.